What is your background on the bike, and what have you achieved so far in your cycling career? My love affair with bikes and bike racing began my freshman year at UCLA. I was a runner in high school but was not fast. When I graduated, I didn’t really know if I wanted to try and continue running in college. I had only been accepted into schools with large Division I programs, whose teams I had no chance of competing for, and I figured club running probably wouldn’t satisfy the zeal I had acquired for rigorous training. While this internal debate was happening, I had begun to commute to work during the summer on a fixed-gear bike. I had so much fun riding to and from work, and it started to become the one thing I looked forward to every day. I worked as a janitor for three years during the summer to save up money, and I can’t even express to you how liberating it felt to get on the bike after a day of—quite literally sometimes—watching paint dry. It brought back a lot of good memories of when freestyle BMX was my life before I transitioned into running. I’ve finished on the podium at the Elite National Time-Trial and Criterium Championships; I’ve placed in the top ten at the USA Professional Time-Trial National Championship; I’ve lived and raced in Belgium and raced in the Dominican Republic, Canada, China, and Rwanda; and I’ve traveled all throughout America and raced in 11 states. It’s been absolutely insane the places I’ve been and things I’ve seen all because of the bike. How did you balance your time between attending UCLA and maintaining your fitness? Between cycling, sleep, studying and having a social life, I found you could really only have two of those at a time, maybe three if you were diligent and lucky. Needless to say, my social life took a bit of a hit more often than not, as did my sleep. Because a lot of my homework was plowing through books, I would see if I could find an audiobook version of whatever text had been assigned to me and listen to that while I did my longer rides. That saved me a lot of time and made the long endurance rides I did in the pre-season actually fun. In one quarter (10 weeks), I think I went through between twelve or thirteen 250–400-page-long books, which felt like a huge accomplishment. You volunteered to be a personal sherpa for one of the top donors at the Mike Nosco Memorial ride. What was that experience like? The experience was absolutely incredible. Chapeau to Janel Holcomb and Eric Bostrom for organizing the program just two weeks before the event. They let me into a group of wonderful people and allowed me to help out with the amazing work that Jack Nosco has been doing for the community as a way to honor his brother’s memory. The program was designed to pair competitive cyclists—amateurs and professionals alike—with a donor who gave over $1000 to the Mike P. Nosco Foundation, which works to provide financial assistance to members of the greater Thousand Oaks community suffering from life-threatening illnesses. My “sherpee,” Sheri, absolutely crushed it and didn’t even need me. Spending the day riding with her and getting to know her was fantastic, and we have still kept in touch. What are your plans for life after racing? As of right now, I see myself becoming a teacher and hopefully coaching a high school cycling team, or working in Junior Development. As for teaching, I would like to think that all the experiences I’ve had on the bike have taught me a lot about life and how to go about pursuing your passions, and those are lessons I genuinely feel should be imparted onto younger people, along with classroom curriculum of course. I myself was caught in this spiral of stress in high school and college, always anxious about what I was going to do with my time, and I wish I had someone just tell me, “Find something you love, do that, and I guarantee you will be the happiest and most productive person you can be.” If I can have that kind of impact on just one student, like many teachers did on me, I can die a happy person. What are your best tips for maintaining year-round fitness? Don’t? I guess it depends on what your goals are, but unless you aren’t mortal, you physically can’t maintain year-round fitness. People need off-seasons not only to give their bodies a break from the stresses of racing, but also their minds. If you try to maintain year-round fitness, 99 percent of people will just burn out, and that’s no fun at all. Try and take time, either with your coach or just with yourself, to target races you want to do well at. For me, at least, part of the fun of sport is one’s progression in it; seeing where you started versus where you are now. It’s almost impossible to see any progression if you’re constantly fatigued and can’t race to your full potential. Do you prefer trainers or rollers? Trainers if I’m actually trying to get a workout in, and rollers if I’m just looking to do a quick spin and I can’t go outside. Honestly, though, I’ll brave the cold, rain, wind, whatever, just to not ride indoors. I truly hate it, and I will always rather be outside on my bike than indoors going nowhere. What race are you looking forward to participating in most in 2019? 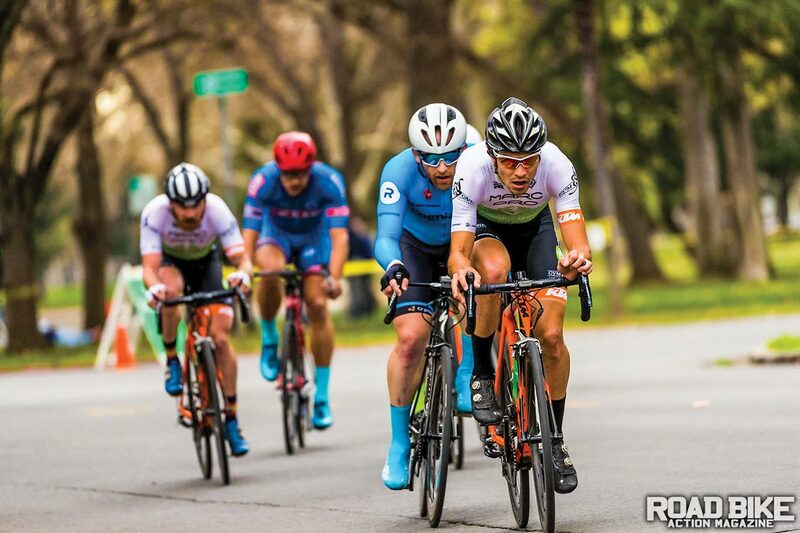 I’m not exactly sure what my schedule’s looking like right now, but I’m really jonesing to get back and compete in the Redlands Bicycle Classic. I love the courses of that race, and the town is always so welcoming to the riders. In last year’s edition the host house that the organizers paired my team with wasn’t able to host us anymore, because the day before we were supposed to arrive, one of the family members had fallen off a ladder and needed to sleep downstairs. The community rallied together and found us host-housing just in time. Needless to say, it’s always been a great experience for me, both on and off the bike. I’m working as a coach for the UCLA cycling team and filing for my credential to do some substitute teaching work, but I also work for my girlfriend’s energy bar company doing social media content management and content write-ups. What is a common misconception of racing professionally? It’s a lot harder than it looks. Behind every race are hours of training, hours of supplemental work (i.e., stretching, physical therapy, gym work), hours of travel, and a lot of dollars coming from riders’ own pockets to get them to the events. Sometimes, just to show up to an event can be a victory. At this year’s Colorado Classic, the Rwandan national team had a nightmare travel fiasco, and didn’t arrive to Colorado until 7 p.m. the night before the race started. So, along with being utterly jet-lagged, they had to build their bikes immediately when they landed, and never got an opportunity to spin out their legs and probably just didn’t sleep. However, they still got up the next morning, lined up and made the most of their racing opportunity. If you’re watching from the sidelines, you don’t see that. If you are looking for an energy bar that tastes like a cookie, please give JoJé Bar a follow on Instagram, @jojebar, and consider ordering some bars from us via Amazon or through our website, www.jojebar.com. Jess Cerra is a professional cyclist for the Hagens-Berman|Supermint Team, who also moonlights as a professional chef, and she co-founded the company two years ago with local SoCal elite racer John Abate in order to provide athletes a sustainable source of energy that they’ll actually want to eat. If you want to support a small local company that helps give back to charities and enjoy what I think are seriously the best bars available, you should definitely give them a try.